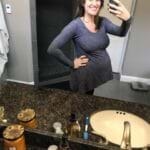 Clothing Dilemma: How Do I Dress This Growing Bump? For the last 10-plus years, I have had a serious shopping addiction, which I blame primarily on discovering Anthropologie in college. I did so much damage there, that when my father put the pieces together that Anthro was a store, not a class, he wasn’t even mad, he was impressed. The point is, that clothes are important to me and I have been collecting them for years. Fall is absolutely my favorite time for shopping. There are few things as wonderful as curling up with September Vogue on a crisp fall afternoon and poring over the trends for the season. Normally, my work breaks this time of year consist of brief shopping excursions where I fill my online cart with things I probably could live without, but absolutely have to have. Until now. At this point, I am 15 weeks pregnant and absolutely overjoyed at how this baby is developing. It is so fun to see a bump that is 100% distinguishable from the cheeseburger from the night before. Aside from lingering fatigue, I am feeling pretty darn good. I will say, however, that my belly seems to be progressing faster than other first time moms. I started showing a bit around nine weeks, either due to my extremely short torso or my preference for pizza in the early weeks of pregnancy (okay, fine, my preference for pizza always). The first thing I had to give up from a clothing standpoint was the jeans. While I could get them on okay in the morning, by the afternoon, my belly was popping out of the puppies. Sure, I could have tried the belly bands, but I am the type of person who gets uncomfortable when my sock is on wrong, so I didn’t think they would be a good option for me. So out the jeans went. Not only were my clothes not fitting right, but I wasn’t feeling particularly attractive. While pregnancy is a beautiful thing, I had to retrain my brain to accept the changes in my body that didn’t look pregnancy-related just yet. And as a shopaholic in withdrawal, sure, I could buy shoes, scarves and handbags to my heart’s content, but to really own the new me, something had to be done about my wardrobe. It was time to dive into maternity wear. Because Anthropologie doesn’t have a maternity line, I reached out to my stylish lady friends who had been through this before to ask them where they found maternity clothes that were both fun and reasonably priced. Then I got down to business. I started by hitting up Target for some basics. I needed below-the-belly leggings, some solid v-neck t-shirts and long sleeve shirts. I can’t even tell you what a difference it made for my body confidence to wear a maternity tee instead of my husband’s undershirts. The arsenal arrived in the mail yesterday and I am already sitting comfortably in my over the belly Jessica Simpson jeans from Destination Maternity. It’s so nice to be in jeans again! With a sweater and my favorite boots, I’m back in my fall uniform, and feeling like a lady once more. Suddenly, my body looked like I was pregnant, not like I was trying to hide a hangover. For me, stressing about what to wear was taking away from the more important things happening around me, like the miracle growing bigger every week right before my eyes. While building a new wardrobe isn’t cheap or easy, I was pleasantly surprised by all of the options that were available. But I have a long road ahead of me, with six more weddings between now and baby, not to mention the holidays. 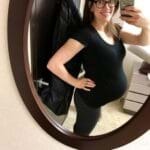 Help a fellow mama-to-be out. Any must have maternity purchases?